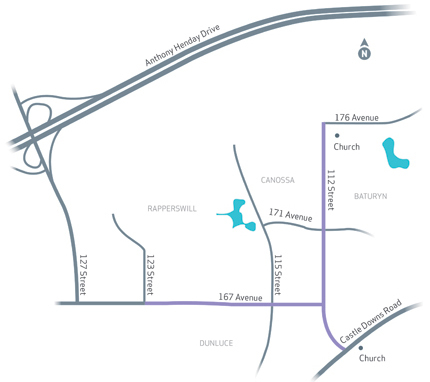 112 Street and 167 Avenue are arterial roads on the north side of Edmonton serving both residential communities and commercial districts with long-range plans to connect to future developments in St. Albert. The City is conducting a roadway widening planning study to improve current road conditions and traffic flow and to accommodate future retail and commercial growth in the communities of Rapperswill, Canossa and The Palisades. In order to determine the upgrades and changes required, a concept plan will be developed for 112 Street from Castle Downs Road to 176 Avenue and 167 Avenue from 112 Street to East of 127 Street. The plan will look at potential road widening, intersection improvements, roadway upgrades and urbanization plans. The goal is to improve safety and traffic flow for all road users along 112 Street and 167 Avenue. Over 2 km of roadway improvements. 112 Street will be widened from 2 lanes to 4 lanes from Castle Downs Road to 167 Avenue. 112 Street from Castle Downs Road to 176 Avenue will be converted from a rural road configuration to an urban road configuration. Urban lanes can include sidewalks, shared-use paths, streetlights, trees and provision for drainage. 167 Avenue from 112 Street to East of 127 Street will be widened from 2 lanes to 4 lanes. Intersection improvements will be studied at all intersections along the corridors. 112 Street/ 167 Avenue recommended concept plans are available for review. Subscribe to receive updates on the 112 Street and 167 Avenue Planning process. This study was initiated in late Spring 2013 and was completed in early 2014. At a January open house, current ideas and plans were presented and feedback was gathered from residents and area stakeholders. Technical considerations and suggestions from the open house have informed changes to the draft concept plans resulting in the recommended concept plans. The City of Edmonton held an open house on January 29, 2014 to present the draft concept plan for roadway improvements to 112 Street, from Castle Downs Road to 176 Avenue and 167 Avenue from 112 Street to east of 127 Street. Thank you to everyone who attended and to those that completed the online survey.